So in our first post dedicated to pursuing your own education we talked about using the pomodoro method to help you get focused and take care of some big tasks. Today I want to talk about my favorite strategy for working on an assignment. Being a working mom and going to school is tough. I often work on my assignments after 8:30PM or before 7AM. It's not easy to be gung ho about getting work done around those times. So when I have an assignment yo complete, I find that my best tactic is to start by laying out all the headings/sections I have to write or questions I need to answer. Then I go to whichever section I want and start writing/brainstorming/jotting down key phrases or concepts I want to include. This works for me because it's essentially creating an outline but without doing so in a totally separate document. One I run out of information, I simply pick a new section. This process continues with me jumping back and forth filling in information as it hits me. Once I get to a stopping point, then I go back and start editing or focusing on completing one section. Again, sometimes this is entirely out of order (but I find it tough to write an introduction till I've fully developed and explored some ideas). Because I'm getting my masters in educational technology and totally online, most of my professors have us use Google Docs and Drive. If you haven't checked these out yet you are missing one of the greatest free tools the Internet (Google) has to offer. Not only do Google docs save automatically, they offer super-simple share features, a research tool that can help you create your reference list, and it can be accessed from any computer as long as there's Internet. Talk about a winning combination. So that's this week's trick for working on and completing an assignment for your education while juggling the duties of work and the duties and joys of motherhood. What are your best tricks? How do you get work done? Are you a coffee shop worker or do you need a quiet secluded place to work? If you follow us on Instagram, you may see that some of our posts show us working on our own schooling. What you may not know is that Nat is a Doctor. Word. She finished her PhD last year and is now teaching a class (in addition to working full time). I'm currently working on my second master's (because why stop with one?) in educational technology online...also while working full time. Since I'm on maternity leave, finding time to squeeze in assignments, readings, and required posts feels a little bit easier. But when I'm working full-time, I've found the BEST way for me to get things completed is a little something Natalie introduced me to: The Pomodoro Method. First, let me tell you that I don't claim to be an expert on this method. If you want to learn more from the pro's - here's a few more resources (Video, Article). However, I am an expert on ADD and having 15 unfinished projects going on at once and an inability to finish one completely. 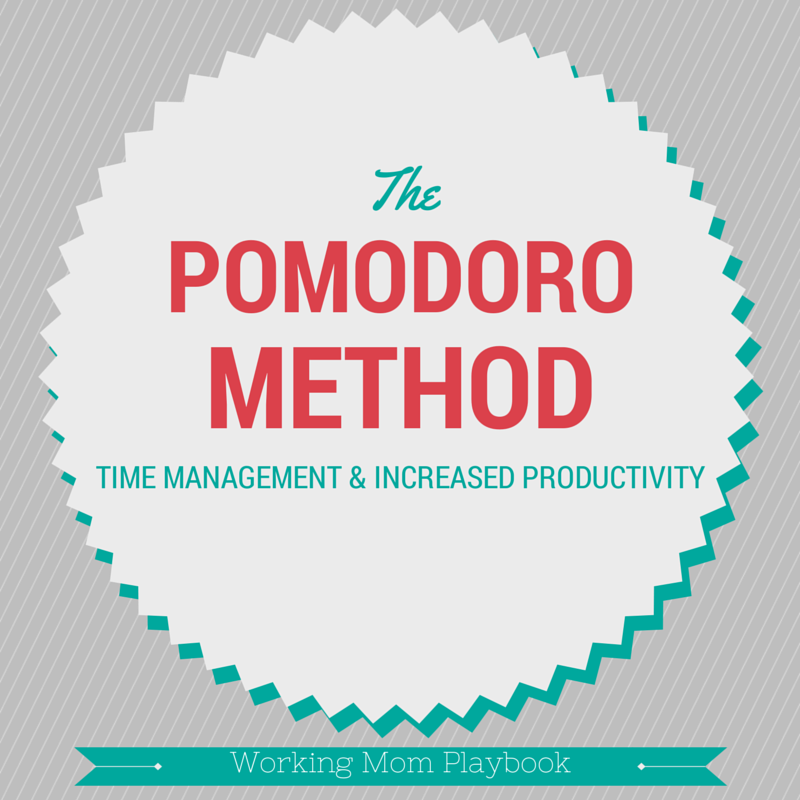 This is why I believe the Pomodoro method is such a game-changer for me. Essentially, you set a timer for 25 minutes and write down a goal that you hope to achieve. Once you complete that task, you get a break. So for example, maybe I need to get started reading an article. Until the timer is done, you focus on that one task. If you read the book or the article, there is more to it, like dividing up tasks, determining how many pomodoros you need to complete the task, etc etc. For me, there's something about setting a timer that is actually kind of freeing and works for my brain. I know that during that time, I have to focus on that task and nothing else. I also know that once I'm done, I get a break. If I'm working something on the computer, I use that 5 minutes to get up and move around - maybe clean up the kitchen, switch the laundry, refill my wine water. Truth be told, I don't always do the full 25 minutes. I usually pick somewhere between 15 and 20 minutes (especially if my daughters are home with me). I find, though, that once I get the ball rolling, I tend to work for even longer. This is seriously one of the quickest and easiest strategies that I have implemented that has helped me to increase my productivity and manage my time better. Stay tuned because we have more posts coming with our tips and tricks for pursuing your own education while working (and attempting to stay sane) - see the part 2 here. We'd love to hear your tips, too or even feature you as a guest blogger! 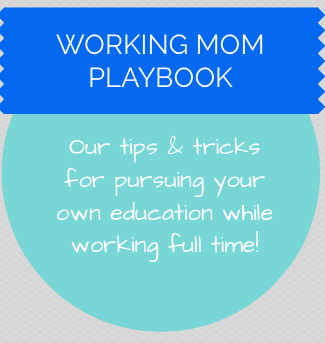 Email us at workingmomplaybook[at]gmail.com! A few days ago we had my nephews over after school. I love love love these boys, but they can be picky eaters. So when it came time to picking something out for dinner, I figured I'd keep it simple and go with something I knew they would like: pizza. Duh. Now around here we love to cook. Pizza included. In fact, sometimes I think we make a better pie than our favorite local joint. So the pizza was going to be homemade. I worried about whether or not the boys would eat it. If there's one thing I know, though, from raising my daughter it's that if she gets to help cook, she's much more likely to try eating or even enjoy something she had previously not tried/liked. 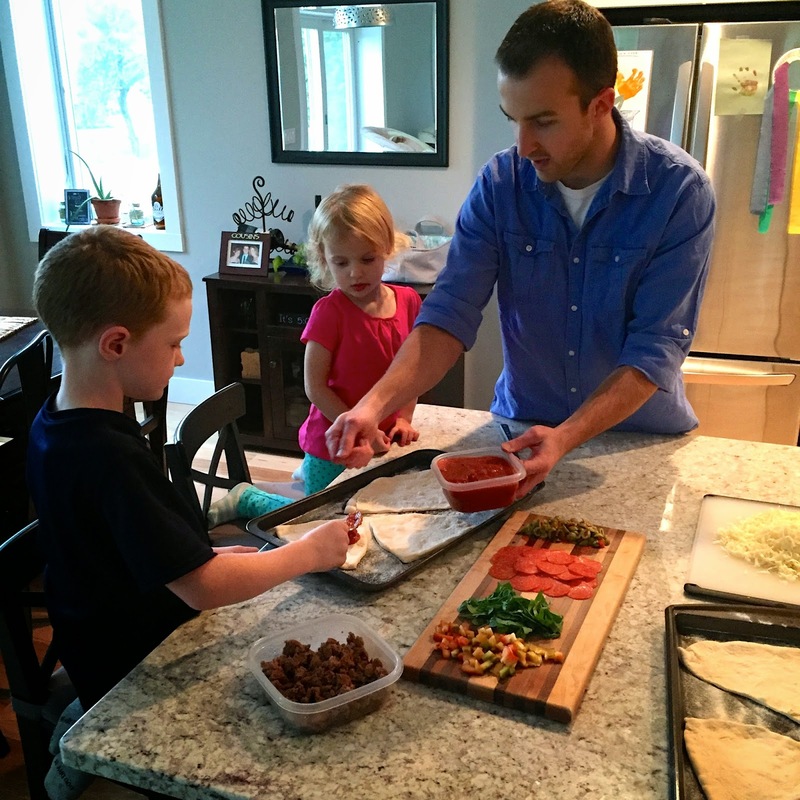 Enter individual pizzas for each kiddo that they got to make themselves. I cheated and bought frozen pizza dough. You can usually find this next to the frozen bread dough and I happen to think it's about 25 times better than the quick mix in the baking aisle, the pre made crusts or the ones out of a can. The only catch? You have to give it time to thaw. I find that if I pull a ball of dough out in the morning before work and leave it on the counter all day, it's usually perfect when we get home. Or you could always pull it out even sooner and let it thaw in the fridge for a day or two. My husband is the expert dough stretcher-outer and so he got to work on that. The older boys even tried their hand at tossing the dough in the air. I mixed up a batch of our favorite homemade sauce. It's an old recipe from Cooking Light that we keep coming back to. The only way I stray from the recipe is that I pulse this in the blender quickly. That way there's no tomato chunks in the sauce. Not that it's super-chunky to begin with, it just works better that way with the kiddos. 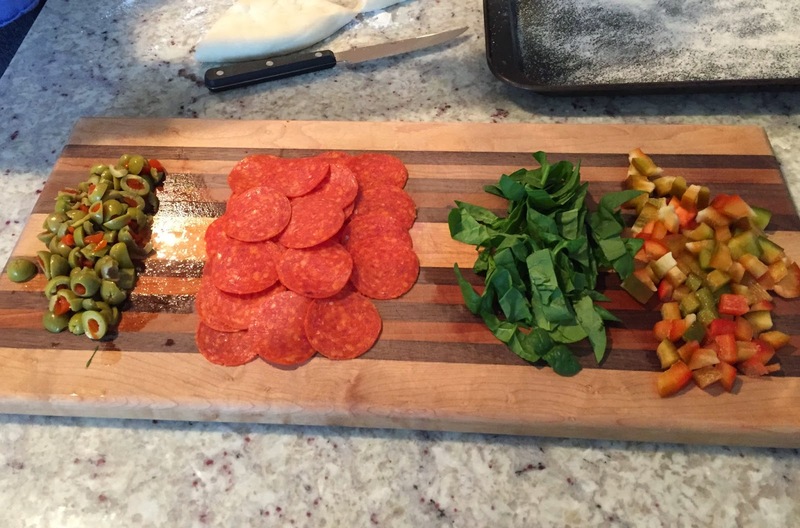 Then, I put a spread out of all the toppings I knew they'd like and some I hoped they'd try. Well try they did not (even our daughter insisted on cheese only when she usually eats spinach and almost any other topping we put on our pizza)...but I was ok with that. The big thing was that I hoped they'd eat what they made. They LOVED putting the sauce, cheese and toppings on themselves. In fact one of my littlest nephews favorite phrases right now is "I did all by myself", and we heard that many times during pizza prep and dinner. 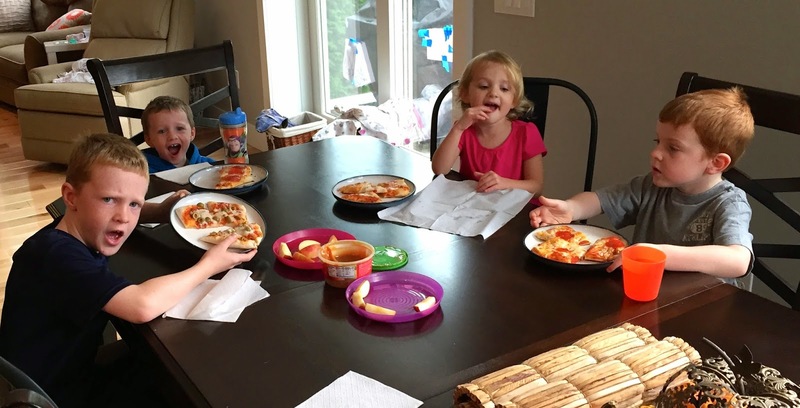 After that we popped the pizzas in the oven and told the kiddos to run back downstairs to play while they cooked and cooled. They DEVOURED their pizza and kept telling us that they liked and how they made them all by themselves. When my brother came to pick them up, they continued to tell that story. 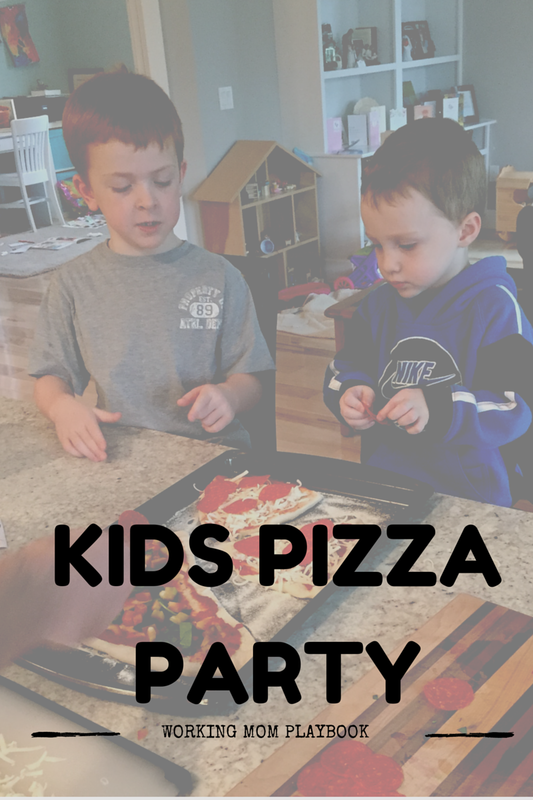 So if you're looking for something fun to do with the kiddos this weekend, spread out the dough, the toppings and let them get to work on their own pizza. Share your creations with us on Instagram, too! Last night my husband and I had a 'come to Jesus' about our finances and how to cut costs. It seemed like the easiest way was to get rid of our cleaning lady (insert tears here...). I know I know, having this little service is a luxury, but I sure did love to come home every other Tuesday to a clean house. What we weren't loving, though, was the $75 cost that came with each cleaning. So today I've been searching for a cleaning schedule in my free time. Nothing seems great...yet...which is why we'll probably make our own schedule (because I know if this thing doesn't exist, the house will not be clean). But, the one common trend I found out there was that many people try to start a load of laundry every day and then finish it up that night. Maybe this isn't as mind-boggling to you as it is to me. We used to do laundry on Thursday nights and through the weekend. Then, during the week we wouldn't have to worry about it - it was done. Now that we have another little one in the mix (who is a champ at blowing out diapers), I've come to find that laundry is NEVER done. So, rather than stress about it or get a little irritated that I left the kitchen dishtowels downstairs or the occasional 'potty accident' bag from daycare, I figure there'll always be a load the next day. So, starting today (if I have a full load of laundry - because we don't like to waste) I'm going to try tossing it in in the morning. We'll see how it goes...and if clothes actually get folded...and then put away. Don't even get me started on ironing. What are your best laundry secrets? Do you wash baby clothes and adult clothes separately? 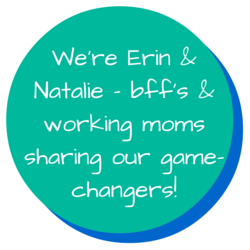 Each month we like to feature an app that's a true 'game-changer' for us as busy, working moms. Let me start by saying that this is an app and a website. So regardless of whether or not your have your phone or a phone that can download this app - this product could be awesome for you! 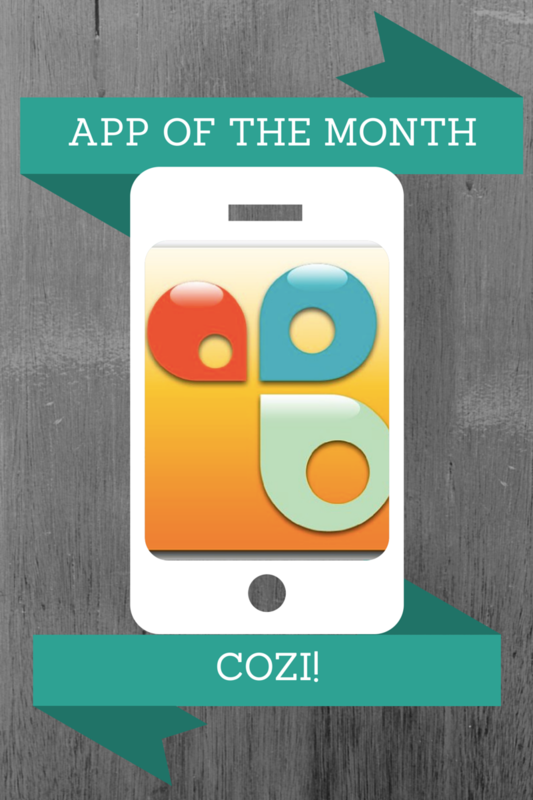 Using the Cozi app allows you to sync lists on multiple devices as long as they're all signed in to the same account. So, if you're like me you quickly whip up a honey-do list for the hubs so he can see it and all the updates you add to it ;). In reality though this has been a great app for grocery shopping so either one of us can go to the store and get everything on our list! When we run out of something in the kitchen, I typically just grab my phone and add it into Cozi quickly. Or, if my husband has a special brew request for the game over the weekend, I know exactly what to snag at the store...or vice versa! The other thing we love Cozi for in our household is getting projects done. We built our house and just moved in last November. While we opted for our contractor to do most of the work for us, we did choose to keep a few things unfinished that we knew we could do ourselves without the added labor cost. We thought we'd get those projects done lickety-split (insert crazy laugh here). So while they're not all done yet, we have a list that we update and prioritize regularly to keep the progress moving. We use the free version of Cozi and have found it to be perfect for our needs, but for a few more features and less ads, you can upgrade to Cozi Gold for just under $30 a year. Considering it costs less than a new planner and has the great syncing feature it might be worth it. Here's a list that compares the features between the free version and the Gold version. Do you use Cozi and love it? Or do you have another great app we should share? Submit your app and why you love it to workingmomplaybook[at]gmail.com! Disclaimer: we weren't paid or perk'd to endorse Cozi. We just really like how it makes our life easier and the time it saves us! Oh and that things get checked off on our honey-do list! Happy Tuesday and back to school! The daycare drop off always seems a little tougher after a long weekend --probably because the weekend full of snuggles, and squeaky laughs and sweet sleepy babies makes it that much harder to be away. Today was one of those tough days. Where I want to bundle him back up in his carseat, grab a latte, and head home to do nothing but enjoy his "baby-ness", all day long. There was a mom dropping her little one off for the first time this morning. I saw her tears and felt my own eyes welling up a bit. So, inspired by this morning's events, here are some helpful tips (at least we found them helpful!) for wrapping up maternity leave and getting ready to go back to work. First, don't think about maternity leave ending, or going back to work, until you have to. I've had "friends" start panicking about going back to work, and their child is only a few days, or a few weeks old (and by friends, I am clearly referencing myself). C is my first baby, and during the first few weeks I would gaze down at him, and then start to wonder how I would ever be able to leave him, and then I would SOB. Uncontrollably, S.O.B. Fortunately, and with the help of a very intuitive hubby, I realized that if I spent all of my maternity leave worrying about going back to work, I wouldn't fully enjoy my time off with my little guy. So when those thoughts of having to go back started to creep in, I worked (really hard) to remind myself that I could worry about that later, and to enjoy the sweet buns-up kneeling munchkin napping on my chest. It actually worked! After a day or two, I barely thought about going back and it remained that way until the last week of my leave. My heightened awareness helped me to really stay in the moment and savor every little last snuggle. 1. Don't think about going back until you have to. 2. Go back on a Wednesday or Thursday. 3. Have family or close friends babysit the first week. Starting a new child care routine, leaving your little one for likely the lengthiest time yet, AND getting back into the groove at work is a LOT of change for one week. If a parent, sibling, or friend can watch the baby that first week it will be one less worry on your mind. My sister stayed with us during my first week back and it was comforting to know he was having fun with his auntie while I was away. Coming home to folded laundry and dinner in the oven was an added bonus! 4. Let yourself grieve your maternity leave. Cry, complain, sob...do what you need to. It is HARD to go back. Period. 5. Develop your own mantra. 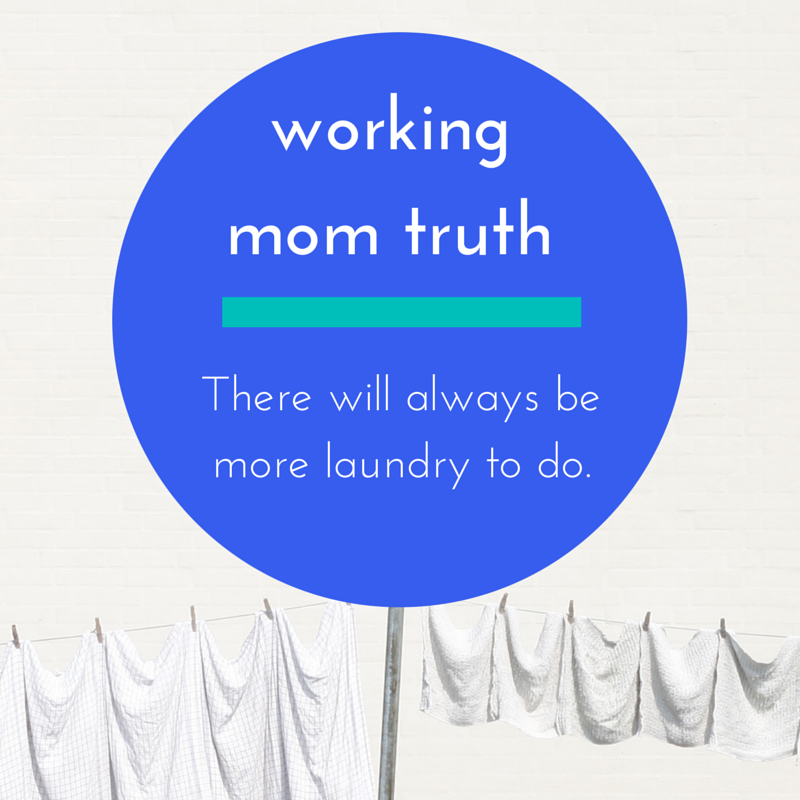 As many mamas do, I felt guilty that I was not staying home full-time. To battle this guilt, I reminded myself of the benefits of work and daycare (yes, there are some!). My internal monologue usually went something like this, "He's building a great immune system...He's socializing and learning...Our time together is truly quality time and appreciated now...We can save for college...We can go on Vacation....etc, etc." 6. Call daycare. Check in. See how things are going. Trust us, they're used to hearing from mommas on their first week back to work. They'll be happy to fill you in. And it might just make you feel better to know that everything is going well. I promise, it gets easier, although (only 5 months back) I am hesitant to say it will ever get easy. While there are some (most!) days that I LOVE my job and am happy to be a working mama, there are also some days where it is a struggle to leave him in the morning, and I drive to work with wet eyes. What are your tips for going back to work post-maternity leave? My Kids Adventures: Easy, Planned-Out Adventures for you & your kids! When I was meeting with a colleague yesterday and talking about this 'mom blog' thing, he directed me to My Kids Adventures. This site is pretty fantastic...especially as a teacher who spends all day with my kiddo in the summer. Don't get me wrong, I love hanging out with my sweet little Liza, but sometimes I run out of activities. And sometimes I just can't seem to think quite quickly enough to find something kid-worthy. That's where My Kids Adventures comes in...they've created multiple 'adventures' that you can have with your kiddos. Then, each post starts with a great picture, a quick little blurb about why it's important and then they give you STEP-by-STEP (did anyone else sing that like NKOTB....c'mon I'll admit it) instructions and the goods that you'll need to get rolling. Some of the posts even include a video. 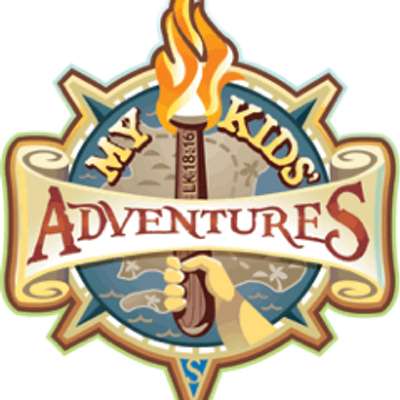 Check them out at mykidsadventures.com or even on Twitter at @Kids_Adventure or on Facebook at My Kids' Adventures! What are your favorite outside activities or 'best plays' with your kids? Popcorn. It's kind of a staple around here.